Japanese particles are among the most fascinating and important to your understanding of the language. Particles are suffixes – they attach themselves right after words (nouns, verbs, and adjectives) and phrases in the sentence. Think of a Japanese sentence as being built out of separate blocks of information. Particles work as the glue and the labels – they simultaneously hold the blocks of information together, and also labels these blocks to give them meaning. 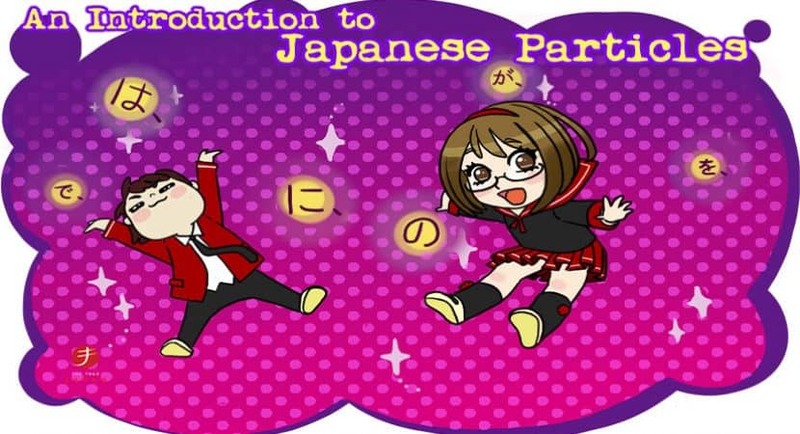 Let’s take a look at 6 of the most commonly used Japanese particles. When used as a particle, “は” is always read as “wa.” If you would like to know the history of why this is, check out the video below. は (wa), is the topic marker. English Translation: Bob is sleepy. As I mentioned in the intro, particles are suffixes. They attach themselves after words and phrases it wants to affect. Since は (wa) comes after ボブ (Bobu), は (wa) is marking ボブ (Bobu) as the topic of the sentence. The capital of the United States is Washington D.C. In our example sentence, “The capital of the United States” is the topic of the sentence. Japanese sentences work the same way. [The capital of the United States] + “は (wa)” + description + desu. Example: The capital of the United States は Washington D.C. desu. In Japanese: アメリカの首都はワシントンD.C.です. (Amerika no shuto wa Washinton D.C. desu). What’s the difference? There’s a lot of differences between は and が , but let’s learn the basics first. The topic of a sentence is usually the main idea you are talking about. Whatever comes after the topic is usually emphasized. The subject of a sentence usually emphasizes what comes before it, and is often doing an action. While there are many differences between the nuances of using は (wa) or が (ga), a general rule is that you will use は (wa) whenever you are introducing new information to someone. For example, if it’s your first day of work at a company in Japan, you will most likely have to give a self-introduction to your co-workers. Since no one knows you yet, you will be talking about new information (in this case, about yourself). Since you are introducing new information about yourself, you’ll use the particle は (wa). English Translation: I’m Taylor Swift. It’s a pleasure to meet you. Also, while this doesn’t work for all cases, you may notice that は is often used for nouns or adjectives that describe the topic, while が can be often seen with verbs. What makes this difficult is the location where you use は (wa) or が (ga) is exactly the same. You can also use both for many situations. Let’s take a look at some examples to help clear things up. English Translation: Bob is a boy. English Translation: Bob is cool. English Translation: Bob is running. But there are always exceptions to this rule. The particles は (wa) and が (ga) also can be used to express exclusivity and contrast. As for Bob, he’s sleepy. Or As for John, he’s smart. This gives you the feeling that Bob is sleepy, but other people might not be. For sentences where you describe something with a noun or adjective, は (wa) expresses contrast and が (ga) is used to express exclusivity. This phrase can either use は (wa) and が (ga). Let’s see the differences between the two. This is the same with adjectives as well. Just like with nouns, you can decide to use は (wa) instead of が (ga) when assigning a verb to the topic, you can express a subtly different nuance too. The に (ni) particle allows us to label things in our sentences as locations. Specifically, に (ni) expresses locations which are destinations, and locations where things are at. So sentences like, “I’m going to the supermarket,” and “My car is in Japan,” all use the location marker, に (ni). 私の車は日本にあります。(Watashi no kuruma wa nihon ni arimasu). へ (e) is like に (ni), but it expresses direction and not destinations. This is a very subtle nuance, but it’s very important. You might be physically transporting yourself to Japan in both sentences, but “I’m going to Japan” uses に(ni) and “I’m headed to Japan” uses へ(e). Watashi wa nihon ni ikimasu. English Sentence: I’m headed to Japan. Watashi wa nihon e ikimasu. Just remember that へ (e) is focuses on the direction that something is moving towards. The particle で (de) also allows us to label things in our sentences as locations. Specifically, で (de) expresses locations where actions/activities take place. So sentences like, “I will be shopping at the supermarket,” and “I will drive in Japan,” all use the location marker, で (de). English Sentence: I will be shopping at the supermarket. 私はスーパーで買い物します。(Watashi wa suupaa de kaimon o shimasu). English Sentence: I will drive in Japan. 私は日本で運転します。(Watashi wa nihon de unten shimasu). I call を (wo, or o) the “being done to” marker because this particle marks what is being affected. What was eaten? The cake was. The cake is the direct object of the verb eat (taberu), so we mark it with the を (wo) particle. English Sentence: I ate the cake. 私はケーキを食べた。(Watashi wa keeki wo tabeta). English Sentence: I ran a marathon. 私はマラソンを走った。(Watashi wa marason wo hashitta). But what about a sentence like, “I met him.” This is a perfectly valid answer to the question, “who did you meet”? However, this sentence uses, に (ni). English Sentence: I met him. 私は彼に会った。(Watashi wa kare ni atta). Using を (wo) there would be very awkward here, as it implies that you are “using” the person you met like an object. This is something Japanese people learn as they grow up around the language, but if I may, I’d like to add my interpretation of the grammar here. When you meet someone and talk to them for the first time, it’s a bit nerve-wracking. It’s a bit fun and exciting, but is also a little scary. It’s an adventure. And adventures are something you go to (に). So this might be the Japanese language way of telling us, meeting people is an adventure. Particles are wonderful pieces of the Japanese language that can when utilized correctly, amplify the effectiveness of your sentences significantly. In this article, I briefly went over each particle. However, there’s enough information about particles for someone to dedicate their entire lives exploring their subtle nuances. There’s even a 331-page book on the subject of the differences between は (wa) and が(ga). If you have any questions or insights, please let us know in the comments below!